In creating and maintaining a successful e-commerce website, one of the most critical aspects of that success is the ease by which prospective customers can locate your site in the vastness of the Internet. Hyperlinks passed from one person to another, is certainly a significant contributor to any site's traffic. But far greater is the traffic resulting from people using search engines, such as Microsoft Bing and Google Search. As a consequence, search engine optimization (SEO) has quickly developed into a key tool in the arsenal of any serious online entrepreneur or Web developer. SEO is essentially the fine-tuning of a site's textual contents in order to maximize the chances of the site showing at or near the top of the results provided by search engines to users seeking websites related to their search terms (keywords and key phrases). Site copy — i.e., the text visible on one's Web pages — is considered by many SEO experts to be the most important location for the keywords and key phrases that you want associated with your website. However, your competitors most likely have the same or similar words on their own sites. So you need something to stand out from the crowd, and one way to do that is by using URLs that include keywords, to be picked up by search engines. For instance, consider two Web pages selling the identical item, with identical Web copy. One page has the URL http://www.example.com/index.php?id=12345, and the other one has the URL http://www.example.com/womens-wool-scarf. The latter page is more optimized for search engines than the former. In this brief tutorial, I will show how to implement an SEO module for CubeCart, which is one of the better shopping cart solutions available to Web developers. This tutorial assumes that you have CubeCart 3.0 installed and working. If you don't, then you can learn how to install and configure it my earlier tutorial, "CubeCart 3.0 Installation and Configuration". 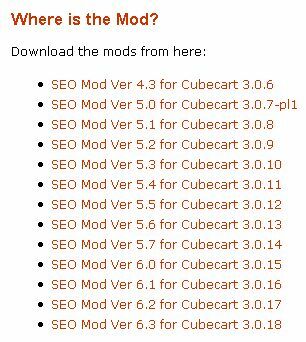 The particular CubeCart module that I will be using, is SEO Mod, authored by Joseph Rukshan Fonseka. First visit the module's Web page. Near the top of that page, you can read the license terms. Similar to CubeCart 3.0 itself, you can use this module for free provided that you leave the copyright notice displayed on your website. If you would like to remove that notice, then purchase a license for a very reasonable fee (currently $10). About halfway down that page, you will see numerous links to download the module. Click on the link that corresponds to your release of CubeCart 3.0.x. In order to install the SEO module on your CubeCart site, you will need to do some merging of SEO Mod code into your existing CubeCart code. There are many tools that can ease the process, but in this tutorial I will be using WinMerge, which is a visual, text file differencing and merging application. It is open source, free of charge, and runs on Windows. Like any quality differencing tool, it is extremely useful for determining what has changed between any two project versions, and then merging changes between versions. 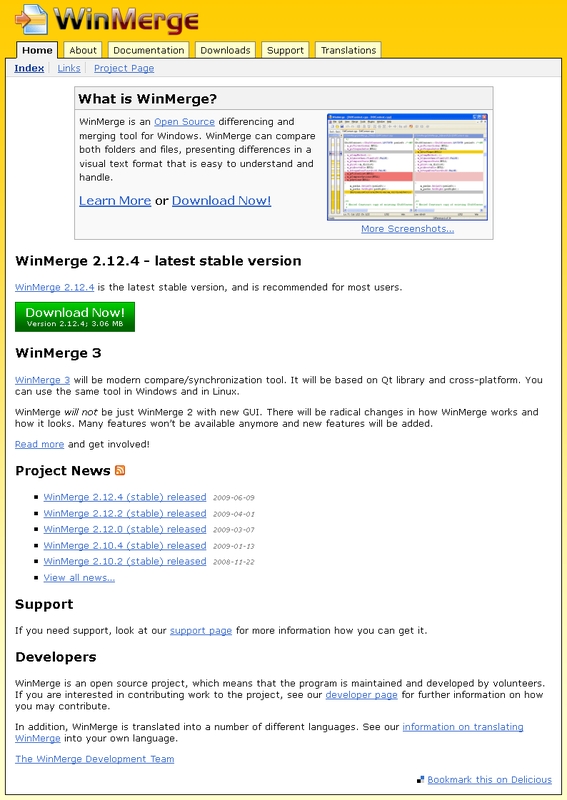 Download and install WinMerge, or whatever alternative differencing tool you would like to use for this project. In addition, be sure to do a full backup of your CubeCart files and database, just in case the modifications that you make end up partially or fully disabling your CubeCart site — in which case you will be able to recover by rolling back to the backup version of your site. Unzip the SEO Mod archive file, which comprises a number of files and directories. If you are installing the code on a completely fresh CubeCart installation, then you do not have to worry about any merging, but can overwrite the existing CubeCart files with the SEO Mod files. Otherwise, use your chosen merging tool to merge the SEO Mod changes into the existing CubeCart files. For those Web developers who (wisely) keep track of changes to their databases, note that this module will add new fields to some of your CubeCart tables. I won't list the details here. In CubeCart's admin area, go to General Settings, and choose "Click HERE to install these new fields now". (This process runs $_GET['sefmetainstall'] in admin/settings/index.php.) Then go to Store Config > General Settings > Search engine friendly URL, set it to "Use search engine friendly URL", and click the "Update Settings" button. Lastly, for "Specify server configuration", choose "Apache RewriteRule supported", and again click the "Update Settings" button. Many developers prefer creating websites on a local server prior to uploading it to any remote server. Note that the option for "Apache RewriteRule supported" works on just about any remote server. However, it also works on a local server only if, in the site's .htaccess file, you have added or modified the RewriteBase value so as to point to the root directory of your site. Otherwise, anyone accessing a page other than the home page, will receive an error of "400 Bad Request". In any case, the option for "Apache directory 'lookback' and ForceType supported" works in all circumstances, regardless of your .htaccess file settings. If you have followed all of the procedures correctly, the module should now be working on your CubeCart site, and you will notice that the URLs are much more attractive to search engines, as well as human visitors. But do not assume that everything is working perfectly. There is always the possibility that these changes have created one or more broken or otherwise invalid links on your site. Be sure to check for broken links after performing the installation and configuration. In fact, you should be doing some sort of link checking on a regular basis — not just for your CubeCart sites, but for all of them. The website on the book is superb. Good mix of pics and print. Font. Lay out. And so on. I really love the book's cover. Perfect.